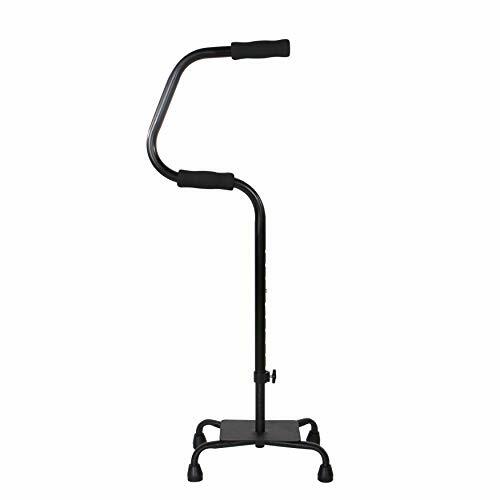 The PCP brand model 5190 Easy Riser Quad Cane is designed for men and women to help relieve pressure on joints and legs when standing or when rising from a sitting position. Properly used, it generally held in the hand opposite of the injured limb or pain. The ergonomic offset handle grip provides comfortable support and prevents hand muscle cramping; distributes body weight directly down the telescoping shaft. May be easier to grip for some individuals with limited use of the hands; larger, more comfortable grip. This type of portable cane is for those individuals who require only a minimum of support and stability. Also makes a great gift for elderly friends and grandparents. Easy Riser Cane features stabilizing technology which increases traction and improves balance during both indoor and outdoor use. This compact and light travel aid is a classic for a reason; recommended by hospitals and orthopedic medical and healthcare providers. Made in USA.